Your daily scoop of what State of the Union is watching today, June 5, 2014. 1. Obama: "No apologies." President Obama forcefully defended the deal that freed U.S. Army Sgt. Bowe Bergdahl from nearly five years in captivity. The agreement to give up five Taliban prisoners at Guantanamo Bay in exchange for Bergdahl has ignited a political backlash from many Republicans and a few Democrats in Congress. 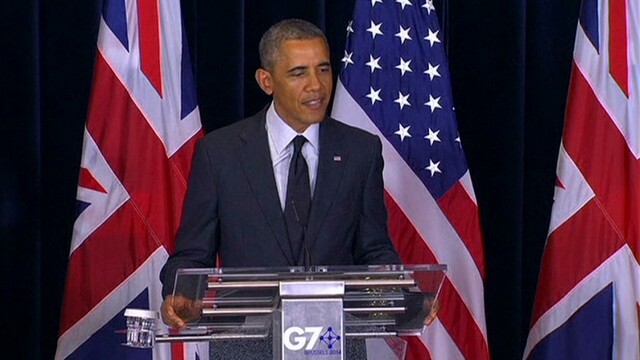 At a news conference in Brussels, where he attended the G-7 summit, the President offered no regrets. "We had a prisoner of war whose health had deteriorated, and we were deeply concerned about, and we saw an opportunity, and we seized it. And I make no apologies for that," Obama said. 2. Bergdahl's condition. The 28-year-old soldier is showing signs of improvement. The Pentagon says Bergdahl is conversing with medical staff, "more engaged" in his medical treatment and is speaking English. Bergdahl is being treated at a U.S. Army medical center in Landstuhl, Germany. He has not yet spoken to his parents. 3. The Taliban. Bergdahl's former captors are talking about how they view the deal that led to his release. "I cannot explain how our people are happy and excited over this unbelievable achievement. This is a historic moment for us. Today our enemy for the first time officially recognized our status," a senior Taliban commander involved in the negotiations told Time magazine. When asked whether the prisoner swap inspires the Taliban to kidnap others, the commander said "Definitely. It's better to kidnap one person like Bergdahl than kidnapping hundreds of useless people. It has encouraged our people. Now everybody will work hard to capture such an important bird." 4. Clinton vs. Putin. Russian President Vladimir Putin is offering some tough talk about Hillary Clinton. In an interview this week, Putin said the former Secretary of State has "never been too graceful in her statements." The Russian leader was responding to a question about Clinton's comparison of Putin's moves in Ukraine to that of Adolph Hitler in Nazi Germany. Clinton later dialed back those comments. "When people push boundaries too far, it’s not because they are strong but because they are weak," Putin said of Clinton. "But maybe weakness is not the worst quality for a woman."